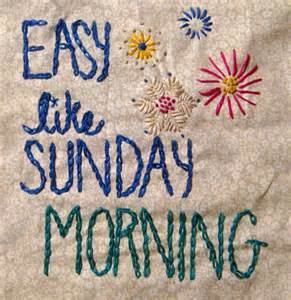 It may say “easy like Sunday morning” but this Sunday morning my head is spinning! I mean it is not necessarily a bad thing, its just not an easy thing either! No it is not spinning with bad thoughts (YOU know ME better than that!) it is just spinning with many thoughts. I woke up at 6:34 on a Sunday morning! I guess that is OK because I love to wake up bright and early any day of the week to see what He has given me today; I mean other than the gift of today. I am always excited to see what small, or big, surprises lie in wait for me on the new day! I think my mind is reeling still from my recent hospital stay. I had a lot, have a lot, of things I am still trying to figure out! And I feel a new sense of urgency when it comes to my life goals. I have started writing with renewed purpose, I am taking a couple of courses that will help me get to my end game! I am busy! And that is good! But it has my head and heart filled with tons of stuff!! Not to mention the looming medical bills from my hospital stay! Yeah thats gonna happen!! BOO! I love that I can come here and get it all out…….and I love that even when the storm seems to be lurking on the horizon I am still feeling great!! There really is something to be said for living a gratitude filled life. I love when things happen to validate the progress I have made and to validate my writing and what it is that I want to share with the world! And I am not even going to bother telling you that I actually do know the capital of WI! Because well, you know, with Google and all you would never believe that I really knew it! Because I AM blonde!! ← Follow up on Relationships…..